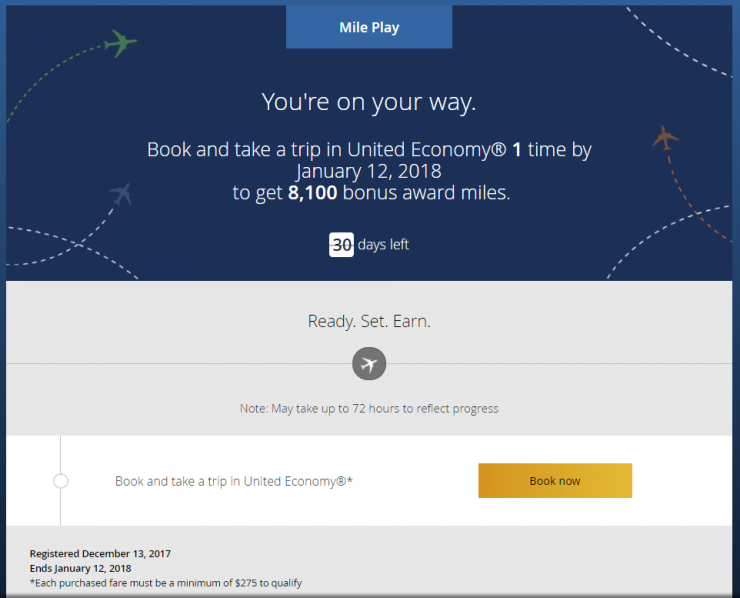 Were you targeted for United Mile Play Bonus Miles? Here I am thinking its going to be some game, or convoluted multi-tier promotion like American AAdvantage put out last month. What I was instead met with was surprisingly simple! Book and take a single trip in United Economy where the purchased fare is at least $275, and I can get 8,100 bonus miles. Travel must be completed by 12 January 2018. If I were to take that at face value, that’d be earning 1,925 miles on the base fare (5x + 2x as a Premier Silver, courtesy of Marriott Platinum status), and 8,100 bonus miles – nearly 30x miles if you can find the right fare! If there’s one thing I’ve learned, you must always read the terms and conditions. These are not actually too bad, again, surprisingly. Trip (as defined below) booking must be made after registration. All flight activity for applicable Trip must be complete on or prior to January 12, 2018. Each Trip must have a fare (as defined below) equal to or greater than $275. The final fare for the Trip will be used to determine satisfaction of offer requirements, including itinerary changes that result in an increase or decrease to the fare and paid upgrades that result in an increase to the fare. For this promotion, only dollars spent on the “fare” on eligible flights operated by United® and United Express® will qualify toward meeting spending milestones. Certain specialty tickets, including but not limited to unpublished, consolidator/bulk, group, tour and opaque fares, will not be counted towards spending milestones. Dollars spent on tickets purchased for flights operated by Star Alliance™ member airline or a United MileagePlus® partner airline with tickets issued by United (ticket number starting with “016”) will not qualify for this offer. The “fare” is the base fare of the ticket plus carrier-imposed surcharges, excluding any government-imposed taxes and surcharges. For tickets purchased in a currency other than U.S. dollars, we will convert the purchase to U.S. dollars using an industry standard exchange rate.Please note that the price displayed when purchasing a ticket on united.com includes up to a 7.5% U.S. Federal Transportation Tax on the base amount of the fare on itineraries wholly within the United States. This tax also applies to certain itineraries between the United States and Canada or Mexico. This fare for example looks like it misses that $275 minimum. Looking at Fare 1 and Fare 2, they total $273.49. All the rest of that $322.40? Its still money out of your pocket, but it doesn’t necessarily count for the promotion. Overall, I love seeing nice, simple promotions like this. Find a $275 fare (after excluding any government imposed taxes), on United or United Express operated aircraft, and get yourself 8,100 miles. I’m not sure whether I’ll be able to do this one myself, but, it does have me looking to see what United can do for me between now and 12 January! 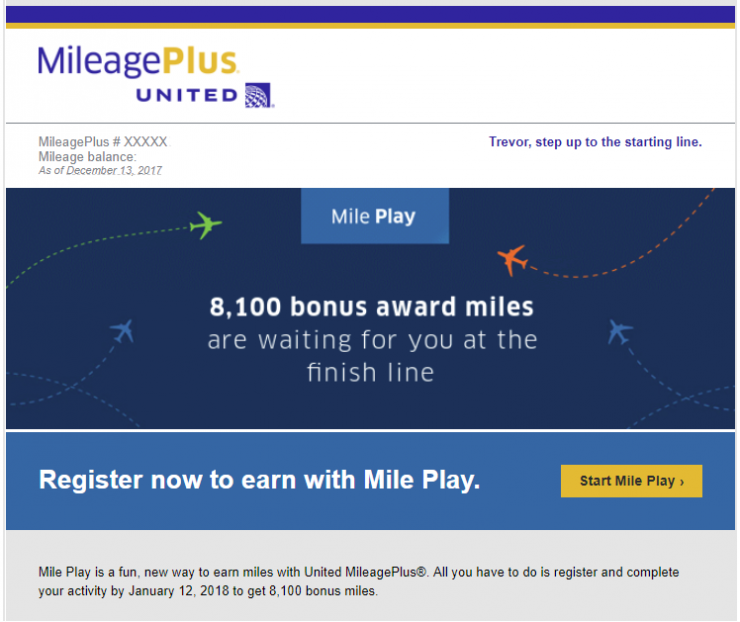 Did you get an invitation to play the United Mile Play promotion? I totally missed this one last week. Great Disney World on property hotel hack. If you’re going to Disney, please stay on property (my recommendation), and this hack makes it a whole lot more affordable! Etihad has gutted Brussels Airline Awards. This was previously a huge sweet spot. Nick, writing for Frequent Miler has a cool post on spending Chase Ultimate Rewards points. Another installment from the Girl and Globe takes on Vietnam. Before reading this, I couldn’t even find Hoi An on a map, now I’m curious enough to look. Last call to earn and redeem Alaska Airlines miles on Delta, from Travel Codex. Hyatt is awarding free nights, but they aren’t necessarily telling you when you’ve earned them. This is why AwardWallet is so great! Hobbies and side businesses, perhaps an apt article as we approach tax day. Shawn follows up on his post and the concerning trend of sellers that are purely fraudulent. Ariana talks about why she’s not manufacturing spend as much lately. I think her post really underscores how important various bank relationships are, and how we should treat them more than just transactionally. Tagging Miles – #Bumpgate and more! Over Covered in the Blogosphere? Was #BumpGate Over Covered in the Blogosphere? Everyone is talking about #BumpGate, where United Airlines involuntarily denied boarding to a medical professional after he had already boarded, resulting in the Chicago Aviation Police physically removing him. That video that I shared above, in 14 hours had 65,000 views. From a quick look at the BoardingArea landing page, there are a total of 45 links to posts. Of those 45, there are 17 posts on the topic. That’s to say that roughly 38% of posts cover United’s #BumpGate. Is that a lot? I’m not sure, it seems like a lot. I realize that I’m definitely missing some, probably more than a handful. For example, View from the Wing has 5 posts, One Mile at a Time has 4 posts on the topic. As a percentage of posts written today, that’s a pretty high percentage for both, but, perhaps not as crazy as back when it was breaking news that the Chase Ink Plus sign up bonus was bumped from 50k to 60k Ultimate Rewards Points. That one had 7 posts by a single blogger, So maybe 5 posts in a single day is pretty high. So far as I understand it, the gate staff knew that they were overbooked, yet the still boarded the plane. It all could have ended before it started, had the gate agent merely not let those individuals that would have been involuntarily denied boarding onboard. Ultimately, it is a shame for us to see something like that video above, happening anywhere, let alone in the US. I mean, it was only a couple of years ago that United had a “self upgrader” removed from a plane in Shanghai. It is just unfortunate to see anywhere. While Social Media and the blogosphere have the duty to report on these things, there’s a certain point, where it seems to get out of hand. Many on twitter have commented how everyone is an expert on the Contract of Carriage today. Everyone is an armchair quarterback, myself included. Could things have been done better? Yes. Should United change is policy? Maybe, or maybe they should just figure out a better way to enforce it–like not boarding before choosing. Either way, the situation was regrettable, unacceptable, and does not help in the way that the world sees United. Is Alaska the first in a new string of devaluations? In the aftermath of the un-announced Alaska Airlines’ Emirates devaluation, Gary Leff posted: Your miles aren’t safe: Devaluations create the need for even more devaluations. While I don’t believe he’s wrong in his assertion normally, I will lay out an argument of why I don’t believe his assertion to be true in this case. In the past few years, we’ve seen the major US-based airlines’ frequent flyer programs devalue. Delta devalued their award chart, and eventually just went ahead and removed it. United followed suit and devalued their award chart. Then American released their much feared award chart changes. On average, premium cabin awards increased by 33-50%, in many cases, more. 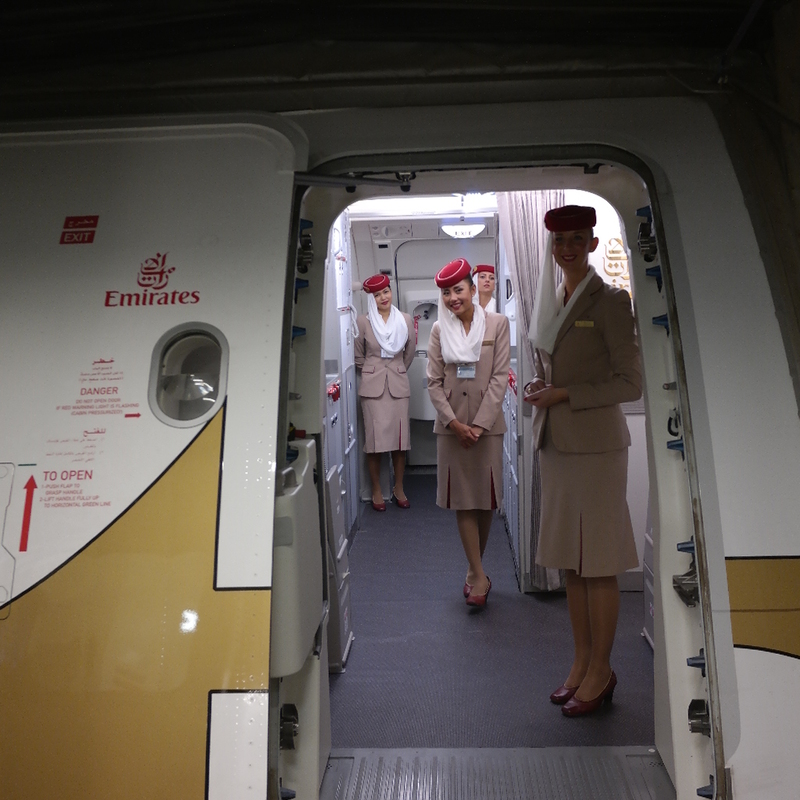 Finally, Alaska increased the cost of Emirates awards (but left all other award charts untouched–thankfully!). The above order is in chronological order. Some may argue that Alaska really doesn’t belong, however I will argue quite the opposite. To that point, I’ll be focusing particularly on awards from the US to the Middle East. Every award will be looking at US to UAE. Delta Airlines – Leveraging Wandering Aramean’s attempt at rebuilding the Delta SkyMiles chart, aptly called: “How many SkyMiles” the rates for business class are somewhere between 70,000 and 190,000 SkyMiles. There is no first class chart (perhaps because many of the core SkyMiles partners don’t fly First Class? Or maybe Delta is scared to venture into the 7 figure SkyMiles awards). United Airlines – United breaks down their award chart based on United metal and Partner metal. Given United’s recent cutting of the DC-Dubai route, I’m going to make the assertion that you’ll need to fly on partner metal to get to Dubai. Given that assumption, you’re looking at 80,000 in business class, or 140,000 in first class. American Airlines – American, thankfully, does not have two prices, depending on which metal you will be flying. This is good, considering American Airlines does not fly to the Middle East on their own metal. That said, their awards are, 70,000 in business class, and 115,000 in first class. Alaska Airlines – Alaska, as I mentioned earlier, only devalued their Emirates redemption, so we’ll only focus on that here. To fly from the US to the UAE, it now costs 82,500 in business class, and 150,000 in first class. After Alaska Airlines’ changes, business class is in parity. First class is a bit high, but, by my opinion, so is United. Ironic, that American, which probably has access to the best or at least second best first class products to the Middle East, requires the fewest miles for that impressive first class product. Overall though, I’d say that the above chart illustrates that Alaska was attempting to move from the lower end, to perhaps the higher end, but still is in parity. It is fair to say that the true value of the Alaska Airlines award on Emirates wasn’t to the Middle East. Rather it is to Asia, Europe, or Africa. While that is not the focus of this post, I’ll go ahead and say this – United is cheaper than Alaska’s new awards (by 50,000-60,000), despite United’s rather lax routing rules. American’s routing rules mean that the only way you get to Asia is if you fly direct, or pay for two awards, so not terribly relevant to the discussion. I never know what the answer is with Delta, so I’ll defer to you all, as I’m sure you, the reader, have more experience with Delta awards than I do. I started this post off, making the assertion that in the case of Alaska Airlines’ devaluation of its Emirates awards, will not beget further devaluations. This is a risky assertion, given that an airline could prove me wrong with a few taps on the keyboard (or formerly, a few strokes of the pen). But I believe based on the evidence I’ve laid out, Alaska Airlines is merely moving into parity with the other airlines. Are some awards still better than others? Absolutely. I would argue that United and Alaska, while higher in cost, are better, because of their more lax routing rules. American, while lower in mileage cost, is less lax in their routing rules. Based on the new mileage costs, is there a clear winner? I would say, it depends, primarily, on where you want to go. What do you think? Is Alaska the last to devalue in the previous string, or are they the first in a new string of devaluations? Smisek is out, Munoz is in, at United Airlines, so what’s next? The past few weeks have been pretty busy, not just for me, but also for what I’d call “Big News.” Perhaps the biggest of that, was United Airlines firing Chief Executive Jeff Smisek. The reasoning is that this is related to a federal investigation regarding the Port Authority of New York and New Jersey. It seems that the investigation came as part of the US Attorney’s investigation of the George Washington Bridge–aka Bridgegate— issue (my word, others might use something like “scandal”). 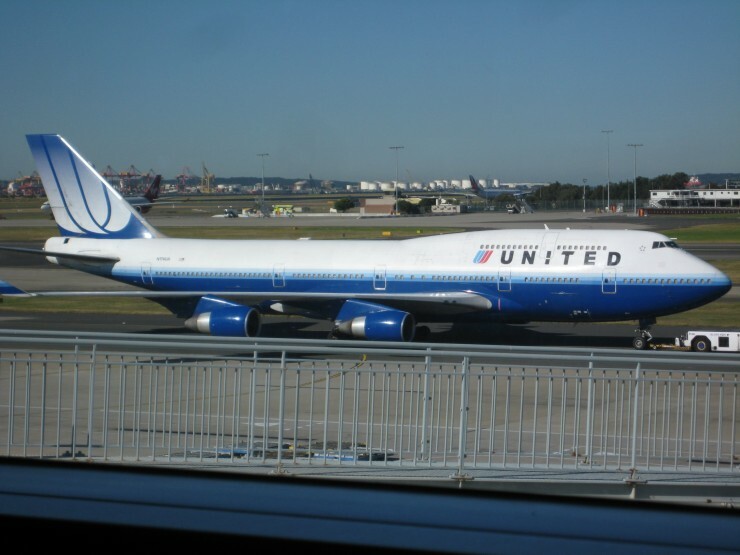 The long and short of how Jeff Smisek and United got involved though, was because they provided a twice-weekly flight between Newark and Columbia, South Carolina, that happened to gain favor from Port Authority of New York and New Jersey Chairman David Samson, and provided an easy flight to his vacation home. It probably didn’t look too good when United cancelled the flight days after Chairman Samson left the position (referenced by Ed in his post about the matter). When I first read about Smisek’s outing, I was jumping for joy, not really knowing Oscar Munoz, nor his accomplishments at CSX. Of course, when I look a little more closely, it really seems like despite many folks asking questions (reference the above View from the Wing post about United cancelling the Chairman’s flight), that this was really a knee-jerk reaction. I don’t see Mr. Munoz as being “groomed” for leading United (in fact, the link about Mr. Munoz implies he was being groomed for CEO of CSX). So here we have a CEO shown the door quickly, who can respond quickly? Someone in-house or on the board. Mr. Munoz fits that bill. Further, based on his biography from United, it looks like he’s a legacy Continental board member, which to me, implies that we won’t see a drastic change in direction. But, I could be wrong. Mr. Munoz’s comments about improving the customer experience is an obvious step in the right direction. He’s already done one thing right, which is, that he hasn’t said that United has too many elite frequent-fliers. Then, he’s up for the task, and will keep it front and center. Overall though, I think this will be a great move for the airline, as I think many didn’t like the “monkey see, monkey do” approach of the former regime, I can only hope that Mr. Munoz takes a different path. What do you think? Do you see changes you will like, in United’s future? Is Traveling on United Airlines Better than Greyhound? My last United flight to Las Vegas and back was nothing special to write about. Despite getting one upgrade to Economy Plus from Cleveland to Chicago, I ended up in regular Economy on the leg from Chicago to Las Vegas. The way back wasn’t any more pleasant. After flying from Las Vegas to Houston overnight (admittedly, by choice), my final leg was traveled over two hours back in a Embraer 145 Regional Jet. Along the way, I ended up getting accosted by a gate agent because I pointed out they were making the final boarding call three minutes after boarding was scheduled to begin on my boarding pass. For some reason, I’m not sure these are the friendly skies that Untied keeps talking about. It got me thinking beyond my Star Alliance Identity Crisis, and why I was flying United to begin with. More importantly, it got me thinking about alternate travel arrangements. I love flying, don’t get me wrong – but what if I could get a better experience on Amtrak (which only runs in the northern part of Ohio), or another provider? This lead me to try to answer the ultimate question: is flying United Airlines better than riding on a Greyhound bus? Granted, my only experience in riding a Greyhound bus was traveling to see some of my college chums while a student myself many years ago. But from what I remembered, the entire experience wasn’t so bad. The ride was acceptable, and most passengers on the bus kept to themselves. And since those days (nearly ten years ago now, to think), Greyhound has improved their passenger experience. Therefore, my intention for post is to attempt to answer the ultimate question: is flying United economy better than riding a Greyhound bus? My goal is to compare the two travel providers in four categories: facilities (airports vs. Greyhound stations), seating, on-board amenities, and overall convenience. Anyone who knows me knows I love an airport. I even have a particular love for Chicago O’Hare: the bane of many travelers’ existence. I think my affection has to do with the amount of time I spent there in college, but I could be wrong. None the less, there’s nothing better than spending time in an airport. I will even book extra-long layovers, in order to take advantage of all the amenities that the flying experience has to offer (like lounge access). Although airports are not known for their neighborhood curb appeal, there is a level of separation between the traveling public and the hoi polloi via the TSA (believe it or not, it might be the only time you truly appreciate the checkpoint). At a Greyhound station, you don’t usually get that level of separation. In fact, I would venture that, because of their open nature and location in particularly urban settings, Greyhound stations may offer better people watching opportunities than even airports. Which is not necessarily a good thing. When it comes to facilities, airports win over bus stations, hands down. While not necessarily a victory for United, it’s a default win by simple comparison. Anyone who has flown economy over the last ten years feels the crunch of reducing seat pitch. Flying United in economy is no exception, as the seat space seems to get smaller each time I fly. With seat pitch ranging from 31 to 34 inches, flying isn’t what it used to be. Of course, I could always spring for Economy Plus seating, and pay an exorbitant amount for five more inches of legroom – but shouldn’t that already be a right? It’s difficult giving a direct comparison between United and Greyhound, considering airlines use seat pitch as an industry-standard measurement. John Walton has a good article in Australian Business Times explaining why seat pitch is a different measurement than actual legroom. That being said, Greyhound boasts their retrofitted buses now have 14 inches of legroom and seat only 50 passengers per bus. 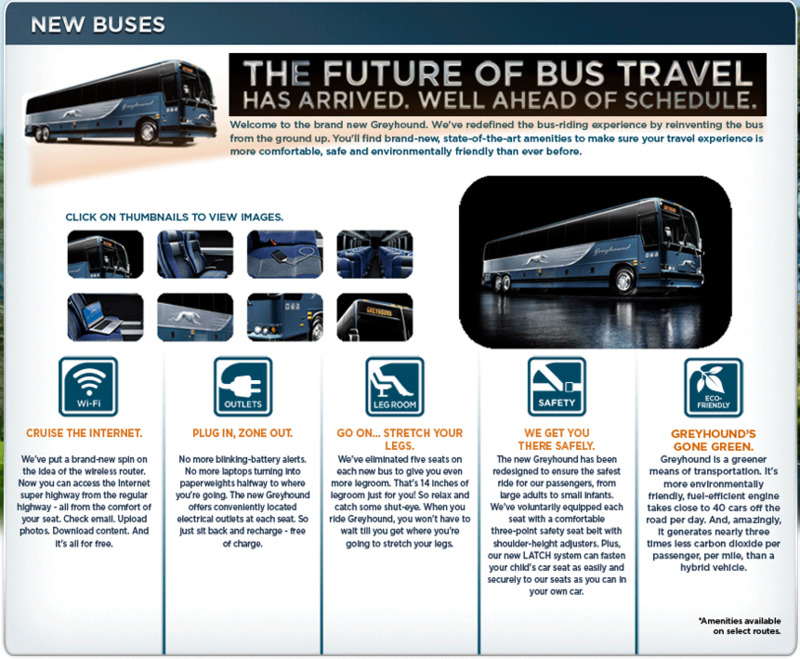 At approximately 12 rows of seats (give or take), Greyhound buses are sure to have more legroom – and seat pitch – than United economy. This round goes to Greyhound. Onboard your next United economy flight, take a close look at everything you’re being charged for. Want extra legroom? That will cost you. Want a power outlet between seats? No guarantees it’s available on your flight. How about Wi-Fi service? Because of international schedules, the pricing will vary and must be prepaid by the hour. This is assuming your flight is equipped with Wi-Fi in the first place. Meanwhile, over at Greyhound, nearly every bus has both power outlets at every seat and free Wi-Fi access onboard. This isn’t an upgrade – it’s included in the price of a ticket. That being said, Greyhound doesn’t offer complimentary beverage service between destinations. But personally speaking, I’d opt for Wi-Fi and power outlets over When it comes to onboard amenities, Greyhound wins. Finally, there is the matter of convenience to consider. In the case of the Ohio-Las Vegas trip I took, it only took me about a half-day of flying arrive at the desert oasis of Las Vegas from the frozen tundras of the Buckeye state. If I had taken that same trek on a Greyhound bus, it would take nearly two days to get there and two days to come home. I don’t know about you, but seeing the United States by bus over two days of driving does not sound incredibly appealing. Once again, simply by the nature of the transportation mode, United wins by default. Despite being around $200 cheaper, four additional days of vacation time to traverse the United States on the road negates any savings that the bus may offer. While I want to say there’s a clear-cut winner in this situation, both options offer their pros and cons. Greyhound may offer a better on-board product, but flying United is simply more convenient – and arguably safer. While I would personally love to try busing across the United States for sheer curiosity, I don’t know that I can afford the time. What I do know is that when comparing the two, I’m forced to choose between convenience and safety over on-board product and passenger experience. Would you rather take a bus over flying? What would it take for you to consider the roads over the skies? Let me know your thoughts in the comments below! This trip was at least 18 months in the making. It also went through varying destinations. We started out with the desire to do an around the world trip, then it became a “quick experience of Asia” trip, with visits to Taiwan and Malaysia (still haven’t made it to either), then we had to delay it. Eventually it started to really take form: Around the world, with stops in Tokyo, and Beijing. 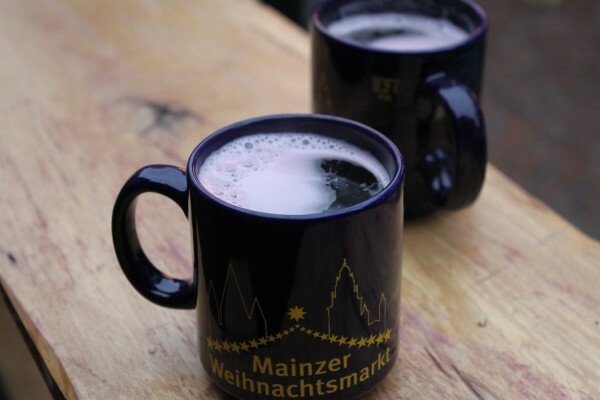 A last minute add (where I learned some lessons), was Frankfurt/Mainz, Germany, for me personally, a huge stop. I think my mother in law enjoyed Beijing and the Great Wall most, and my wife enjoyed Tokyo most. Maybe that’s the sign of the perfect trip. Realizing after the fact, I kind’ve left out a pretty amazing flight on Swiss Air from Beijing to Zurich. Suffice it to say, I had the best steak–ever–in the air. I also skipped the United flight review from Frankfurt to Dulles, primarily because it was originally supposed to be Lufthansa, but thanks to a Lufthansa pilot strike, we were re-booked on United. 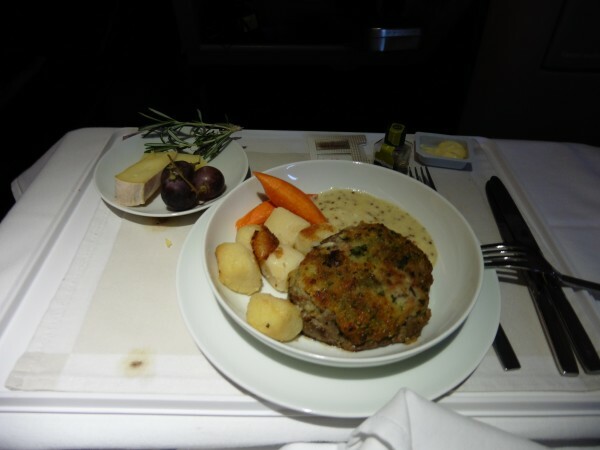 I flew first class, in fact, I burned the additional miles to fly first class, specifically because I wanted to visit the Lufthansa First Class terminal again. Needless to say, the folks at the LH FCT offered tissues as they drove us to the “main” terminal to check in for our United flight. There are no words for how I felt. Overall the trip was pretty amazing. It was perhaps the trip of a lifetime for my mother in law (really the focus of the trip). I know that my wife and I both really learned a lot from our experiences as well. Is Hidden City Ticketing Bad For Everybody? It’s a commonly known hack among the initiated. Even Trevor wrote about how the “hidden city” trick can be good for the pocketbook. But is hidden city ticketing a bad practice that could create harm to the travel ecosystem? That’s what two recent lawsuits against a website specializing in hidden city ticketing are suggesting. Skift recently wrote about the lawsuits against Skiplagged, by both Orbitz and United Airlines. Orbitz claims that booking these potentially cheaper fares threatens their relationship with a number of airlines that ban the practice, including all three American legacy carriers, as well as IAG-owned British Airways and Iberia. Meanwhile, United claims that the tickets “discovered” by Skiplagged are in violation of United’s ticketing rules, which prohibit hidden city bookings. It’s important to note that Skiplagged, as it’s own entity, is not an OTA by the traditional definition. Flyers are still buying their tickets from Orbitz, CheapOAir, or other OTA websites. Although, as a result of the lawsuit, it seems that Skiplagged has turned off hidden city ticketing links for the time being. While this lawsuit works itself out, it does require travelers to ask a bigger question. Is the practice of buying hidden city tickets really a bad thing? As many travelers have pointed out, hidden city ticketing is a good way to save money on an itinerary. By booking to a different destination than the one you’ll ultimately end up at, frequent fliers can save potentially hundreds of dollars. In Trevor’s example, a traveler going to Charlotte can save around $10 by booking through to Cleveland instead, but conveniently “missing” the final leg of the flight. In addition, hidden city ticketing has not always been an outlawed practice. In a column written in 2001, George Hobica (the man behind AirfareWatchdog.com, who also wrote an excellent viewpoint about hidden city ticketing on LinkedIn) pointed out that several airlines didn’t expressly forbid the practice of hidden city ticketing. But of the airlines mentioned in the 2001 article, only Southwest and Frontier still exist. 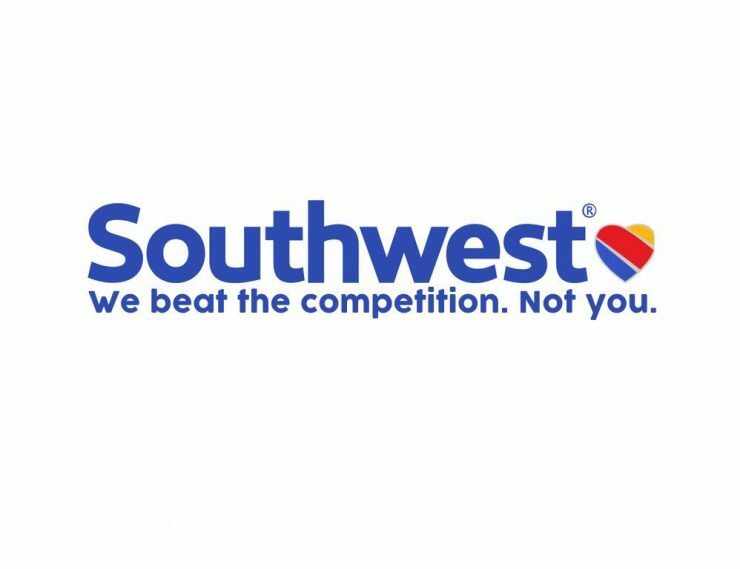 United merged with Continental, Northwest merged with Delta, AirTran is now officially Southwest, America West became US Airways, and ATA went flat out of business. And with those mergers came the rules that banned hidden city ticketing officially on all three legacy carriers. Of course, there is always the argument of ethics in dealing with companies. To which some people may respond: “When have large, multinational companies been concerned with ethics?” That’s a personal decision every traveler must make for themselves. Aside from the ethics of potentially illegal ticketing, airlines have been known to push back against chronic hidden city travelers. 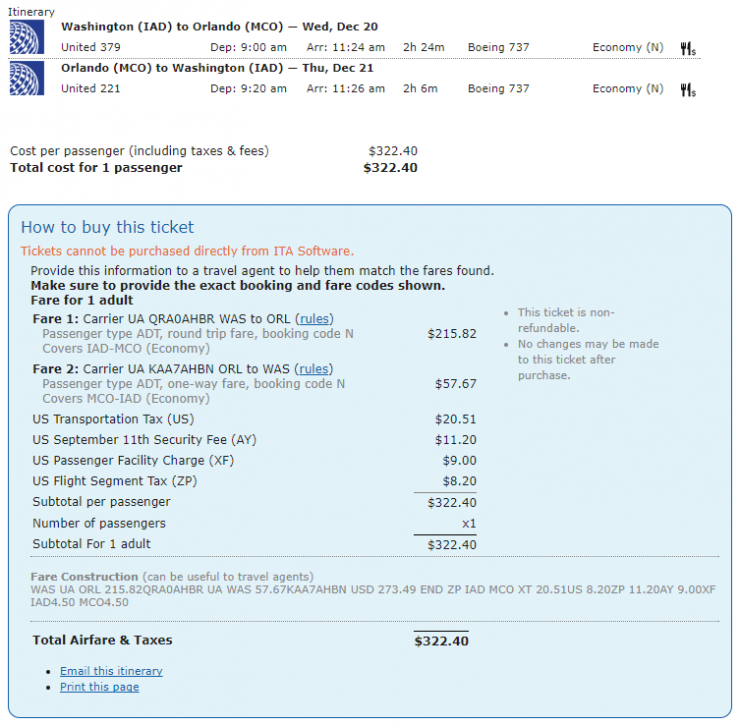 In an active thread on FlyerTalk dating back to 2011, travelers have discussed hidden city ticketing warnings that include receiving warning letters from airlines. Cancel[ing] the remainder of the itinerary and confiscate any unused flight coupons. [Refusal] to board the passenger or check baggage. [Charging] the passenger for the difference between the fare paid and the fare for the passenger’s traveled itinerary. All of the information available suggests that, although strictly forbidden by airlines, hidden city ticketing is still a gray area that a penny-pinching flyer can still slide through. While it can be an easy way to travel on the cheap, it may come with some unintended side effects that could ultimately affect how you travel. As we often say in this business: your mileage may vary. Have you tried hidden city ticketing? Have you received any blowback from it? I’d like to hear your take on the practice – leave me a comment below! Weeks ago, I was lamenting the fact that my Star Alliance Gold Status on Aegean would soon be going away. By soon – I mean November 2015. But that’s still long enough away where I need to start thinking about a backup plan today. In my first attempt, I realized typical alternate options (United and Air Canada) may not be best for my (now) stochastic flying habits. Instead, I need a better option to keep my Gold status while maintaining my level of flying (or increasing, as budget allows). And that’s where the international players can be applied. After some research, I’ve narrowed down my possibility to keeping Star Alliance Gold status by crediting my miles to one of two international airlines. In no particular order, here are the new candidates for my Star Alliance loyalty in 2015. Will Miles and Smiles bring me plenty of both in 2015? With their generous path to Star Alliance Gold Status, it certainly seems that I could be well on my way to at least the Smiles portion. The Good: Turkish Airlines’ Gold Status level, Miles and Smiles Elite, require flyers to fly 40,000 miles in a year. Once the threshold is hit, the status is good for two years. Once achieved, renewing status is lower than other mileage programs. Those who live outside of Turkey need to only fly 25,000 miles in one year, or 37,500 in two years, to renew. And again, renewal is good for two years from the date renewed. While not as generous as Aegean’s three year renewal, this is a good start for those who may have their flying limited in the near future. The Bad: Unfortunately, not all of my flying will count towards elite status on Turkish Airlines. In the fine print on their United page, the carrier notes that only the flights operated by United Airlines counts. Which means my flying from my home airport in Port Columbus (where mainline flights rarely fly) to a mainline airport may not count for the 500-mile minimum. So until I move to a market that is served by United mainline aircraft, my mileage earnings may be hamstringed. The Weird: There have been reports that flyers have been able to successfully status match their Aegean Gold status to Turkish Gold status with a simple request. However, FlyerTalkers have reported that this is turning into a long process that may (or may not) be honored by Miles & Smiles. I’m going to attempt the status match request, but I have no grandeurs that it will be honored in time for my January Vegas flight. I’ll let you know how it goes. The Good: Much like Turkish Airlines, I can earn 100% credit on United Flights by crediting them to Asiana Club. But unlike Turkish Airlines, I have two years to fly 40,000 credited miles to earn Star Alliance Gold status. After I earn Gold status, my card is valid for two years This translates to just 20,000 miles of mainline flying every year to hit Gold Status. Not too shabby for flying United. The Bad: On the bad side, I’m forced to start from square one with Asiana (see below). And although Asiana’s website states that all United flights are credited, I’ve got a suspicious feeling that non-mainline flights are going to get zero credit towards my Asiana status. In addition, my opportunities for earning top-off bonus miles on the ground are limited. Although I could get a Bank of America Asiana Credit Card…I’m not sure that I’d really want to. The Weird: Apparently, from what I’ve read on StatusMatcher.com and FlyerTalk, Asiana will never do a status match. A traveler could have double-secret Super Elite status on an airline, but will still require flyers to start from scratch when moving to Asiana. Which is a strange bug in the system. Both loyalty programs create a conundrum, to say the least. At that threshold of flying (40,000 to 50,000), it would seem to make sense to go back to United and earn upgrades, but no lounge access – right? With Turkish Airlines, I know that I will ultimately be able to use my miles for redemption, but Asiana gives me a longer time period to get my Gold status. Personally, my tiebreaker will lie in getting my status match approved from Aegean to Turkish. If I can get my status matched, then Turkish it is. But if there’s no status to be matched, then it looks like I’ll be marching forward with Aegean. All of a sudden, my Vegas run just got a whole lot more interesting. Which one would you be leaning towards? Let me know how much I’m overthinking this problem in the comments below. And don’t forget to vote for TaggingMiles in the 3rd Annual Travel Summary Awards – voting closes soon!